Visited the Cantor Arts Center Museum at Stanford University for the first time the other day. It has been in the San Francisco Bay Area since 1894 so I should not procrastinate any longer. 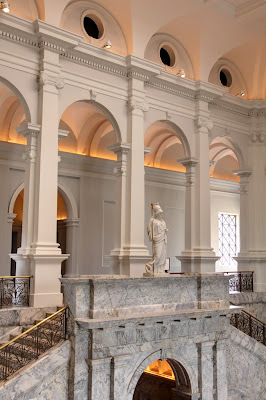 The marble-ladened lobby is beautifully adorned with Greek goddess Athena statue and a 2-sided staircase. And, if you look straight up, you will see its dome. The museum was badly damaged in the 1906 and 1989 earthquakes, but it has been restored and even expanded with an additional 36,000 square-foot wing. 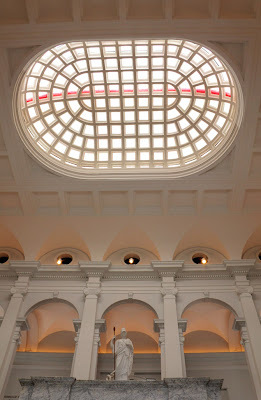 I too have a lot other places and museums to visit for the first time here :( beautiful architecture. Wow, that is quite stunning. I know it is silly to generalise but I found many of the buildings in America to be grand but really clean, tidy and well-kept. There are so many buildings in UK that are simply black with grime. Lovely. This is so huge and beautiful. I like the atrium! These are beautiful shapes and colours. Love the beautiful architecture. Would love to visit it one day. It's magnificent. Easier to get to than than Hearst Castle too. gorgeous architecture. i'd like to see this in person.